Steve Jobs wore black Monday, and not just because that's the Apple CEO's usual sartorial color of choice. 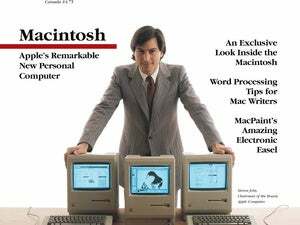 Instead, Jobs donned his trademark black mock turtleneck to preside over a funeral for Mac OS 9. So as a coffin appeared on the San Jose Convention Center stage and Bach's Toccata and Fugue in D Minor echoed through the crowded exhibit hall, Jobs kicked off Apple's annual developers conference by laying to rest OS 9, eulogizing the classic Mac OS as "a friend to us... always at our beck and call, except when he forgot who he was and needed to be restarted." The opening of Jobs' keynote may have lacked subtlety, but it drove home Apple's message to the Mac software developers in attendance--drop whatever work you're doing in the old Mac OS and shift all your efforts to the operating system of the future. "Mac OS 9 isn't dead for our customers yet, but it's dead for [developers]," Jobs said. "Today we say farewell to OS 9 for all future development, and we focus our energies on developing for Mac OS X." But Jobs did more Monday than just exhort software makers to shift all their development to OS X; he also gave them something to develop for, providing the first public glimpse at the next major update to OS X. Code-named Jaguar and slated for a late summer release, the update will add a built-in instant messenger client, handwriting recognition technology, a new version of Sherlock, and improvements to OS X's Mail and Finder, among other features. "After we got OS X 10.1 out, we had a chance to bring out the next wave of new technologies to put into your hands," Jobs said. The annual developer conference gives Apple a chance to sit down with software makers and pore over the nuts and bolts of creating Mac products. It also provides Apple with a forum for spelling out the future direction of the platform. Last year, Apple used the conference to announce that OS X would come pre-installed on every new Mac, a sign of what Jobs called "a total commitment on Apple's part." This year, Jobs asked for that same kind of commitment from developers. The numbers are certainly in OS X's favor. The new operating system began 2002 with one million active users, according to Apple. The company forecasts that five million users will have turned to OS X by the end of the year. Mac developers have pushed out roughly 3,000 OS X-native applications since the operating system's March 2001 debut. However, many of those programs run on both OS 9 and OS X--"understandable in this transition," Jobs said. What Apple would like to see now is more companies following the lead of Microsoft, which announced last month that all future product releases would be OS X-only, like its native Office v.X productivity suite. Indeed, Apple plans to follow the same course of action. Jobs cited the recent release of iPhoto--another OS X-only application--and said Apple's future development plans will focus entirely on the new OS. "One hundred percent of everything we're doing is X-only," he said. That includes Jaguar, the next major version of OS X. Apple expects to release another minor update to the OS before Jaguar arrives by late summer of 2002. When it is released, Jaguar will introduce a number of changes into OS X. Look for spring-loaded folders--a familiar element from the classic Mac OS--to appear in the Finder, working in icon, list, and column views. The Finder also adds multithreading support and an integrated search function. OS X's Quartz engine will undergo an overhaul, creating what Apple bills as Quartz Extreme. The improvement--which requires AGP 2X graphics cards and 32MB of video RAM--is a hardware-accelerated graphics and compositing engine. Quartz figures into another improvement introduced in Jaguar--universal accessibility. Using the graphics engine, Mac users can zoom in on portions of the screen, making it easier to see text files and QuickTime movies. Other accessibility enhancements include a screen reader that will read any text you place a cursor over, full keyboard access, and visual notification. Jaguar promises to improve OS X's Mail feature, adding intelligent spam filtering, auto-merged mailboxes, cross-mailbox searching, color highlighting to set apart threads and messages from specific people, and QuickTime support. The update also adds an Address Book that can, in theory, be used with any OS X application. As an example, Jobs talked about using the Address Book's rollover menu to automatically dial a phone number from a Bluetooth-enabled cell phone. Jaguar will also incorporate updated versions of existing Apple software. QuickTime 6, announced earlier this year will be integrated into Jaguar, featuring full support for MPEG-4 encoding and decoding and Advanced Audio Coding (AAC). The OS X update will ship with Sherlock 3. The latest version of the Internet search and services engine will add new channels that look for images, news, and Yellow Pages-type content. Besides updating existing features and applications, Jaguar will introduce new capabilities to OS X. Chief among them is Inkwell, a handwriting recognition technology that will look familiar to anyone who's ever seen a Newton handheld device in action. "You'd think that hundreds of millions of dollars on Newton technology would get us something," Jobs said. Inkwell will work with any application that accepts text input. Ken Bereskin, Apple's director of product marketing for OS technologies, demonstrated Inkwell in Adobe Photoshop 7, using a pen tool and his own handwriting to change the text of a banner. Jaguar's release will mark the debut of iChat, an instant messaging software that's compatible with AOL's AIM instant messaging client. "We are thrilled to be working with AOL on this," Jobs said. "They're even adopting some of the features we're pioneering back into their app." Mac users won't need an AOL account to tap into iChat--they can use their Mac.com name. Apple's instant messaging program will use dialogue bubbles and photos to display messages as if they were a conversation. Rendezvous--Apple's proposed industry standard for dynamic discovery of computers and devices on IP--will also find its way into the Jaguar OS X update. Using Rendezvous, Macs will be able to recognize one another and share files. Jobs demonstrated the technology by playing streaming music files off the iTunes playlist of another Mac connected to an AirPort network. "This can happen with Music. This can happen with photos. This can happen with files," Jobs said. Jaguar promises something for everyone. On the Unix front, the update includes FreeBSD 4.4, GCC 3, IPv6 and IPSec, the CUPS printing engine, LDAP, and Kerberos full-authentication service. "Mac OS X is the best Unix platform on the desktop, and we're going to make it better," said Philip Schiller, Apple senior vice president of worldwide product marketing. On the Windows front, Jaguar adds SMB browsing and sharing, built-in PPTP VPN security, and Active Directory support. Educational users will benefit from additions such as NetInstall and NetBoot, improved network management, and printer sharing "so that next school year, they can begin to adopt Mac OS X more widely," Schiller said. Monday's keynote was free of any product announcements--hardly surprising, since Apple unveiled its education-friendly eMac and updated PowerBooks a week ago. But Jobs did hint at a product announcement to come. On May 14, Apple plans on introduce a rack-mount server.